tapi tak pake di blog yang mana lagi?? template cewek bangetz.. hehehee. bong.. ntar bikin jg template "paper boy" ya..! hehee..
simple and good style of design template, paper girl. Easy Money Making Part Time Internet Jobs. I just changed my template a little bit , all my widgets lost.Sorry about that.I don't forget to put the link back.Calm down, friend! ini keren! bisa diganti warna gak background pinknya? aku seneng garis-garis warna-warnine sing mbengkong, wekekek... sep lah, pokoke saranku ojo mbok lalikne, ojo enek pengulangan! oke... semakin sedikit pengulangan, semakin mahal kualitas designmu!! mau cri2 templete warna pinky. eh... nemu disini. saya baru je upload template ni. tetiba xblh access blog tu. xde icon nak logout ke nak sign ke.. camna ni? sy x blh download template blog.. I am currently using this one, but I will probably try another one. I have used this one for about a month, I am looking around the site to find a new one. I am looking for one that shows "girly personality" slash "professional." It's a hard mix, but I LOVE this one. So we will see. Suka this template..so beautiful but I have small problem here. The post come out 2x. How do I delete the other post?? Kudu dipiyekke iki mba htmlnya? how to upload at html? ?cannot rite? hye, i luv ur dsign tmplate, its so pinky & girly..but i've small problem here, why i've double post ya?can you help me to fix it? ?btw, thanx!! i have some problems with this templates..why it have double post?how to make it as one post only?please help me..thanks! thanks ! ! ! ! ! ! its so nice !!!!! saya nak tanya..post keluar 2x lah..macam mana nie ya?? 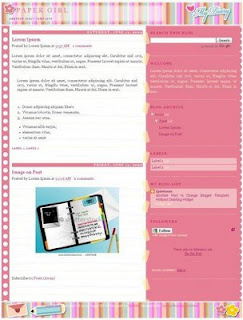 template designer>advance> disini tiada setting untuk pages? Im currently using this theme and I love it. But i was wondering is there a way i can turn this to a 3 theme site. i can understand.. how to upload it.. please help me..
its ok.. i have done do that.. thanks.. next time upload many template, i want use that.. thanks..
tapi tetap nggak bs kok mbak,trus mau tanya lagi.kok postingnya jadi dua ya?gmn bisa kembalikan jadi 1?? Pesan error XML: The element type "body" must be terminated by the matching end-tag "". Mbak udah aku coba berkali kali untuk penghaspusan display:none; tapi yang ada Pesan error XML: The element type "body" must be terminated by the matching end-tag "". mcam mne nk delete balik ? Cocok banget ini templete nya untuk blogger cewek..good.. Simple & Sober template. Really appreciable. nak tau cam mane nak remove words my diary..teringin nak tukar perkataan lain..
i really like this theme and now i am going to download this. thanks for sharing everything about this post. I think that it is most focused on teenagers than grown- up women. because I don't think that those women that they focus more in more serious topic would choose it.